Commemorative Stamp on Dr. Talimeren Ao – 28th January 2018. Talimeren Ao (28 January 1918 – 13 September 1998) was an Indian footballer and physician. He was born on 28 January 1918 in Assam, Naga hills to the Rev. Subongwati Ningdangri Ao and his wife Maongsangla Changkilari, in the village of Changki, in the then Naga Hills District of Assam. In 1943 Ao joined Mohun Bagan, who were then in the Calcutta Football League. He captained the Maroon and Green in 1948 and 1949, taking over from Sarat Das. Sarat Das was Ao's senior in Cotton College, Guwahati, and both of them had played for the Maharana Club of Guwahati. Ao was a striker in the Maharana Club but on joining Mohun Bagan he was positioned in the defense. In Mohun Bagan, Ao was Centre-Half and along with his two Backs, they were popularly known as "the Great Wall of China". He was given the captain's armband in 1948 to captain the Indian Football Team in London. 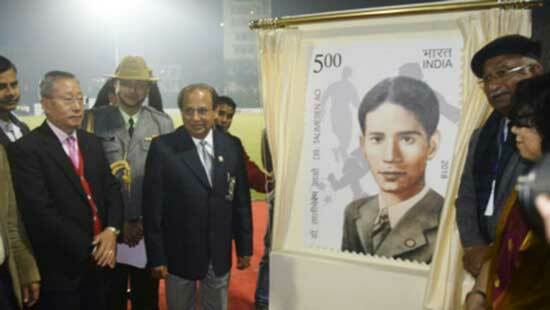 Assam Governor Prof. Jagdish Mukhi released a commemorative stamp as a mark of respect to the legendary footballer Dr. Talimeren Ao on the occasion of the centenary year of his birth anniversary at a function held at Sports Authority of India (SAI) complex playground at Paltan Bazar, Guwahati on 28th January 2018. Commemorative Stamps on Potter's Wheel - 26th January 2018. India Post released a set of two Stamps in denomination of Rs. 5 and Rs. 15 and a Miniature Sheet on the Potter’s Wheel on 26th January 2018. Stamp designs are based on paintings of winners of a stamp design contest organized by India Post in November – December 2017. 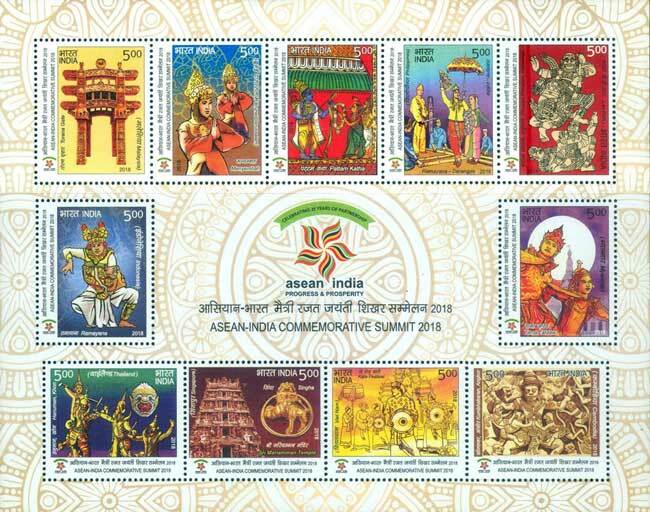 Commemorative Stamps on ASEAN INDIA Commemorative Summit 2018 - 25th January 2018. To mark the 25th anniversary of the ASEAN-India dialogue partnership, 15th anniversary of Summit-level partnership and 5 years of strategic relations, India hosted the ASEAN-India Commemorative Summit in New Delhi in January 2018. India Post issued stamps in denomination of Rs. 5 each on ASEAN INDIA Commemorative Summit 2018 on 25th January-2018 at Shahjehan Hall, Hotel Taj Diplomatic Enclave, New Delhi. Set of 11 commemorative stamps were released by The Prime Minister, Shri Narendra Modi with the ASEAN Heads of State/Governments and ASEAN Secretary General. Eleven stamps depicts Torana Gate - Malaysia, Menyembah – Brunei, Pattam Katha, Ramayana Darangen – Philippines, Phra Lak Phra Lam – Laos, Ramayana – Indonesia, Yama Zatdaw - Myanmar, Khon - Thailand, Sri Mariamman Temple – Singapore, Kate Festival – Vietnam, Kumbhakaran, Angkor – Cambodia. Torana Gate is a torana (a type of gateway) in Brickfields, Kuala Lumpur. The gate is a gift from the Government of India to Malaysia, as a mark of continued friendship between the two countries. It was influenced by Hindu and Buddhist architecture of the Indian subcontinent. Asean countries have their respective versionsof Ramayana; the Philippines has Maranao versions which include a portion in the Darangen epic song, from which the singkil dance is derived, and the story of Maharadia Lawana (King Ravana). The Darangen has been declared one of UNESCO’s Masterpieces of Oral and Intangible Heritages of Humanity. Phra Lak Phra Ram is the national epic of the Lao people, and is adapted from Valmiki's Hindu epic, the Ramayana. Similar to some Malay versions of the Hikayat Seri Rama, the epic has lost the association with Hinduism and is instead considered a Jataka Story, a previous lifetime of the Buddha. It is also very popular in Northeastern Thailand, or Isan, a region of Thailand mostly populated by ethnic Lao and formerly part of Lanxang. The Indonesian Ramayana is the Sri Lankan version of Ramayana authored by Rishi Kamban, titled, "Ramavataram" and was written in Tamil. It is believed that the Indonesian version of the epic was written during the Medang Kingdom (732-1006 AD) in Central Java. It is known as Kakawin Ramayana, as it is in kakawin meter in Old Javanese language. Yama Zatdaw, unofficially Myanmar's national epic, is the Burmese version of the Ramayana. There are nine known pieces of the Yama Zatdaw in Myanmar. The Burmese name for the story itself is Yamayana, while Zatdaw refers to the acted play or being part of jataka tales of Theravada Buddhism. Khon is a dance drama genre from Thailand. It is traditionally performed solely in the royal court by men in masks accompanied by narrators and a traditional piphat ensemble. A variation of this genre with female performers is called khon phu ying. The Sri Mariamman Temple is Singapore's oldest Hindu temple. It is an agamic temple, built in the Dravidian style. Located at 244 South Bridge Road, in the downtown Chinatown district, the temple serves the majority Hindu Singaporeans, Tamilians, in the city-state. Due to its architectural and historical significance, the temple has been gazetted a National Monument and is a major tourist attraction. The Sri Mariamman Temple was founded in 1827 by Naraina Pillai, eight years after the East India Company established a trading settlement in Singapore. Kate Festival in Vietnam, also called Mbang Kate, is organized by the Cham people for 3 days at the beginning of October. This event is held in a large space in the three Champa Towers (Po Nagar, Po Klong Garai and Po Rome). The main purpose of the festivals is to commemorate their heroes like Po Klong Garai and Po Rome, and also deaths in the families. Moreover, the festival is a chance for the local people to relax, to meet and wish one another fortune in the future. Stories from the Indian epic Ramayana have been familiar in Cambodia and other countries of Southeast Asia for well more than a thousand years. The Sandstone at former kingdom of Angkor, depicts Kumbhakarna battles the monkeys, from the epic Ramayana. Commemorative Stamps on India – Vietnam Joint Issue – 25th January 2018. India Post and Vietnam Post issued a set of two commemorative postage stamps of denominations Rs.25 and Rs.5 as joint issue between India and Vietnam on 25th January 2018 to mark the long term friendly bilateral relationships between the two countries. The set of two stamps depicts Sanchi Stupa and Thien Mu Pagoda. The Great Stupa at Sanchi is one of the most important Buddhist monuments reflecting gem of Buddhist art and architecture. Located at Sanchi Town, Madhya Pradesh, this Stupa is the oldest stone structure in India that was built during the Mauryan period. Originally commissioned in the third century BCE by Emperor Ashok this huge hemispherical dome with a height of 54 ft consists of a central chamber where the relics of Lord Buddha are placed. Four ornamental gateways facing four directions and a balustrade surrounding the Stupa were later added in the first century BCE. A typical example of a Stupa and an excellent illustration of the development of Buddhist art and sculpture starting from the third century BC through the twelfth century AD, the Sanchi Stupa attracts hundreds of visitors from across the world. Enlisted as a UNESCO World Heritage Site since 1989, it is counted among the best conserved ancient Stupas of central India. Thien Mu Pagoda is situated on the north bank of the Perfume River in the village of Huong Long, five kilometers from the city of Hue. It is one of the most beautiful and well-preserved religious sites in Vietnam. The name of the pagoda comes from a legend. Long ago an old woman known as Thien Mu (literally "Heavenly Lady") appeared on the hill where the pagoda now stands. She told the local people that one day a King would come and build a Buddhist temple for the country’s prosperity. In 1601, on hearing this legend, King Nguyen Hoang began construction of the pagoda. Further constructions and renovations were done during the succeeding centuries and the Phuoc Dien Tower at the entrance to the complex was built in 1864 (some sources say 1844) by Emperor Thieu Tri. The tower has seven levels, is 21 meters tall and is the tallest such structure in Vietnam. 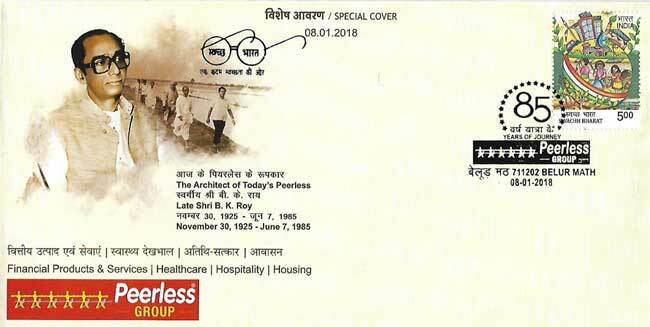 Special Cover on Peerless Group – 8th January 2018. 85years ago in1932, Shri Radhashyam Roy, a primary school teacher in Narayanganj, now in Bangladesh, inspired by the spirit of the Swadeshi Movement, laid the foundation of what we know today as the multi-faceted conglomerate The Peerless General Finance & Investment Company Limited, with an initial subscribed capital of Rs. 300.00 only. From the beginning till today, the journey of the Peerless has been strength by the two pillars of Trust and Integrity. Today, the Peerless has successfully established its presence in the sectors of Financial Products & Services, Healthcare, Hospitality and Housing. Commemorative Stamps on ICAR-Central Plantation Crops Research Institute – 8th January 2018. The Coconut Research Station at Kasaragod in Kerala was initially established in 1916 by the then Government of Madras and subsequently it was taken over by the Indian Central Coconut Committee in 1948. Central Plantation Crops Research Institute (CPCRI) was established in 1970 as one of the agricultural research institutes in the National Agricultural Research System (NARS) under the Indian Council of Agricultural Research (ICAR). The Institute had the mandate to undertake research on coconut, arecanut, cocoa, cashew, oil palm and spices at the time of establishment. The research on cashew, oil palm and spices were later delinked from CPCRI to form separate institutes. The present mandate of the institute is to conduct research on coconut, arecanut and cocoa. On the occasion of 100 years of Coconut Research a set of two stamps on ICAR-Central Plantation Crops Research Institute was released by Colonel S F H Rizvi, Postmaster General, Northern Region, Kerala Circle on 8th January, 2018 at Kisan Conference Agri Business Expo, Kasargod, Kerala organized to mark the silver jubilee of the Krishi Vigyan Kendra (KVK) and the foundation day of the Central Plantation Crops Research Institute (CPCRI). 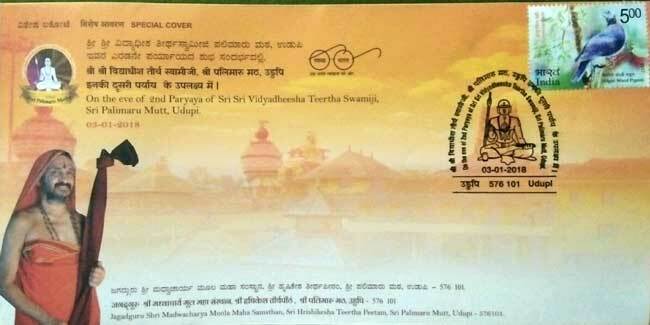 Special Cover on the eve of 2nd Paryaya of Sri Sri Vidyadheesha Teertha Swamiji, Sri Palimaru Mutt, Udupi - 3rd January 2018. His Holiness Sri Vidyadheesha Teertha Swamiji, after completing His paryaya poorva sanchara entered into Udupi. On the eve of 2nd Paryaya of Sri Sri Vidyadheesha Teertha Swamiji a Special Cover was released at Udupi on 3rd January 2018. (Special Cover Approval No. KTK/01/2018).